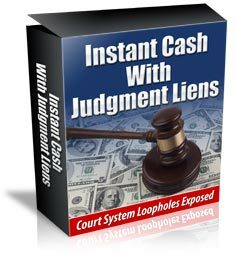 Inside this system I’ll walk you through every simple step so you can be profiting on Judgment Liens in no time. My goal for you: I want you to be able to have your very first deal done and profit in hand in the next 30 days or less! How to use your local courthouse to find “backyard” gems! How and where to find people to do all the hard and boring work for you! Using the internet to find lists of profitable judgments waiting to be found BY YOU! How to shuffle through the abundance of judgment leads available and find the best and most profitable deals first! The 5 KEY questions you must get answered before you do anything! How to get all of your judgments backed by real estate…removing any risk at all for you! The 7 most profitable types of judgments and how to find them fast! The ultimate deal killing signal that you must look out for…it’s so easy to spot I hired a $2/hr virtual assistant to look for this for me! How to pay .05-.15 on the dollar for the most profitable judgment liens (even if it’s your very first deal)! How and what to say to the creditor so you can get the best deal possible! A simple, but very cool, strategy for fats tracking your profits and getting paid in 5-7 days on your deals! How to determine the amount of equity in a debtors property and use it as ‘extra deal insurance’! The formula that all deals must go through before you can even consider buying a judgment lien! Advanced techniques for doing deals WITHOUT your own cash! !